What is a Non-binding Offer? A non-binding offer, also referred to as an indicative offer, is used in a sales process to establish the terms of a deal between the seller and the buyer. It serves as an “agreement to agree” between the two parties. Through the document, the buyer expresses an interestExpression of Interest (EOI)An Expression of Interest (EOI) is one of the initial transaction documents shared by the buyer with the seller in a potential M&A deal. The EOI indicates a serious interest from the buyer that their company would be interested to pay a certain valuation and acquire the seller’s company through a formal offer. to acquire the target, but the agreement is not intended to be legally binding and therefore, it does not constitute a binding contractual commitment to pursue the transaction to the end. It is often used to keep discussions and negotiations moving along between the buyer and the seller. A binding obligation only comes into effect when the two parties agree and sign a definitive agreementDefinitive Purchase AgreementA Definitive Purchase Agreement (DPA) is a legal document that records the terms and conditions between two companies that enter into an agreement for a merger, acquisition, divestiture, joint venture or some form of strategic alliance. It is a mutually binding contract that indicates that the offer is legally binding. A non-binding offer serves as a useful tool to show whether the seller and the buyer share similar terms and views about the transaction. A potential purchaser should make a non-binding offer as attractive as possible to stand out from other purchasers. The offer should demonstrate the purchaser’s ability to meet the terms required by the seller. The offer should be reasonably priced to show the seller that they possess the financial capability to complete the transaction within a given timelinePrivate Equity Transaction TimelineThere are various steps involved in a Private Equity Transaction Timeline. The diagram below shows the different steps in an M&A transaction, which include signing an NDA, financial modeling and valuation, and generating a quality of earnings report.. 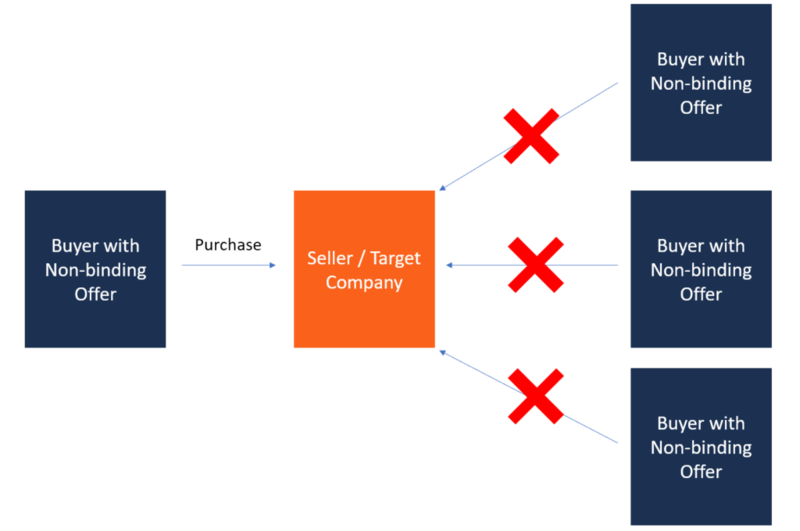 The potential purchaser must clearly indicate the price that they are willing to pay to acquire the target. The price may be stated as a specific figure or a price range that the offeror is comfortable with. The purchaser may provide a summary that outlines how it came up with the price and any assumptions made in arriving at the price. The additional information helps the buyer understand the different price offerings and make a decision on the price ranges they are most comfortable with. The non-binding offer should outline the conditions that the seller and the buyer must abide by during the process. The conditions include internal approvals and any regulatory requirements that the parties need to comply with. For example, the buyer should conduct due diligenceDue DiligenceDue diligence is a process of verification, investigation, or audit of a potential deal or investment opportunity to confirm all facts, financial information, and to verify anything else that was brought up during an M&A deal or investment process. Due diligence is completed before a deal closes on the purchaser to determine if there are any legal outcomes or financial matters that will hinder the progress of the transaction. The conditions may also require disclosing all information relating to the company for sale, such as lawsuits, financial history, and any obligations that the new owner will need to comply with in the future. For the sale of specialized or technical equipment, the non-binding offer may require the seller to provide support for a certain period to ensure the equipment runs smoothly. The support may include moving certain specialists or machine operators with the target equipment to allow for an easy transition. The non-binding offer should disclose any material issues relating to the transaction that require it to be completed within a certain duration. For example, when the owners of a business are retiring, they may prefer purchasers who are willing to complete the transaction before or on a specific date. A purchaser who is interested in acquiring the target should clearly disclose its ability to complete the transaction before the preferred duration in order to gain a competitive advantage over other potential purchasers. The non-binding offer should make reference to the transaction documents that will be signed to formalize the transaction. If the purchaser is committed to seeing the transaction to the end, they should require their inclusion in the documentation to increase the chances of success. The purchaser should also signal their expectations of other parties to the transaction that should be included in the final documentation to formalize the transaction. An indicative offer should include a clear wording that states whether the offer is legally binding or not. Although some aspects of the offer like the section on confidentiality are binding, other sections like the indicative price and the offer itself should be distinguished as non-binding. It should also indicate that the purchaser can withdraw freely from the agreement at any time before the signing of the definitive agreement. The non-binding offer should include an assurance that the offers given by the potential purchasers will be confidential. However, it should indicate the kind of information that will be disclosed to facilitate the sales process and that may be exempted from the confidentiality requirements. The non-binding offer should provide an explanation on the payment terms of the offer and any non-cash consideration that the seller is willing to accept, e.g., amount of payments in cash and the number of stocks that are being proposed as consideration for the transaction. The purchaser should disclose the anticipated source of funds to finance the transaction and any timing required before securing all the funds. The cost section may also make reference to the party who will bear the cost of handling the documentation and if there are any shared costs. The non-binding offer serves as a way for negotiating parties to clarify some fundamental issues of the negotiations before deploying substantial resources to the transaction. For example, the buyer may be interested in acquiring a substantial percentage of the buyer’s stocks as part of the consideration. The non-binding offer provides information on the payment terms. In business transactions, the parties to a merger or acquisition can use a non-binding offer to announce that they are negotiating with the goal of buying or acquiring another company. In the United States, public companies involved in a mergers or acquisition deal must file a letter of intent/non-binding offer with the Securities Exchange Commission. A non-binding offer serves as a protection for negotiating parties in case the deal collapses during the negotiation. A non-binding offer means that the transaction is not legally binding and any of the parties can voluntarily withdraw from the contract before the signing of the binding offer.